The names of the men and women who served for 8 months in the 2008- 2009 OPERATION FACE-LIFT/SKID ROW campaign, have never been revealed until now. These individuals, Heavy Weights, committed themselves to "accomplishing the unimaginable", the transformation of community consciousness, restoring community PRIDE & RESPECT, as well as beautifying the Skid Row Community, specifically THE HEART OF SKID ROW, San Julian Street. 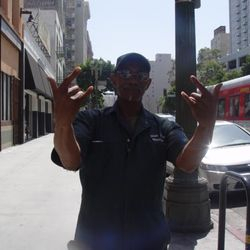 "WE GET UP & GET BUSY"
GENERAL JEFF ( Issues & Solutions), Speaks out on the needs of Skid Row. 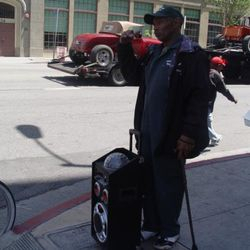 OPERATION FACE LIFT/SKID ROW began in 2008, spearheaded by THE SKID ROW BRIGADE, a grass-roots, community based group, an auxiliary of OG's N SERVICE ASSOCIATION. OPERATION FACE LIFT/SKID ROW is designed to uplift the community residents, to increase their self-esteem and to change their mind-set from negative to positive. 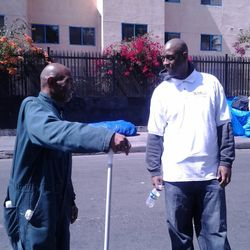 OPERATION FACE LIFT/SKID ROW is truly a "spiritual movement with social implications"! 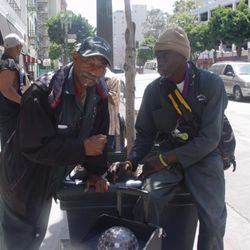 THE FUNKY TRASH CAN CAMPAIGN was the result of the SKID ROW COMMUNITY being denied a most needed necessity, "trash cans"! Having been denied trash cans, in 2007, OG's N Service Association via the SKID ROW BRIGADE got their own. 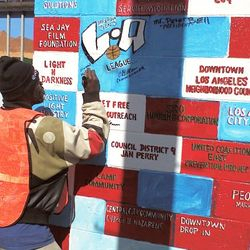 They Created an "art project" and began to place trash cans on the streets of Skid Row with "messages" on them reflecting their mission, such as, "WE WANT A CLEAN, SAFE AND HEALTHY COMMUNITY". The SAN JULIAN STREET MURAL was also a response to the "lack of beautification efforts" on the part of the City and Local Service Providers, but it was also a "grass-roots" effort by the community itself, to express itself and empower itself. The San Julian Mural and all murals are designed to deliver a message of HOPE and express the "Culture of Skid Row", something which most try to deny. 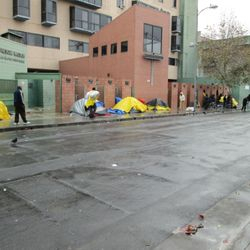 Skid Row is a community and has a culture that needs to be acknowledged and respected...as well as appreciated. 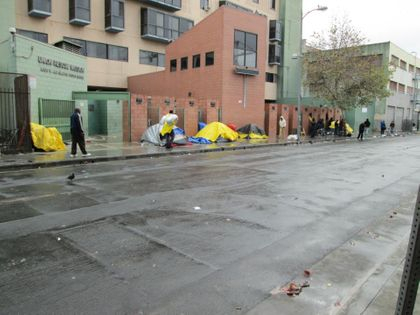 The SKID ROW BRIGADE, (WE GET UP & GET BUSY), is the Greatest Volunteer Unit In Downtown Los Angeles. Founded in 2004, the SKID ROW BRIGADE has served OG's N Service Association as its "Vanguard". A Special Unit capable of being mobilized within 24 hrs. on a grass-roots level. While a "small unit", it's tasks are "always great". This group is capable of providing "leadership" as well as getting the job done. This unit of men and women are from the people and the community. They "inspire people to action" and are responsible for getting things done, from confronting those who feed and leave trash, to setting up for large community events, from placing trash cans on the streets as well as leading the way for providing brooms and trash cans to those living on the street or residing within facilities. 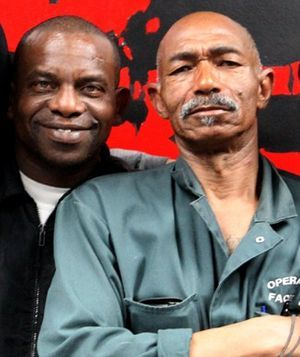 As Chairman of the "renowned" SKID ROW BRIGADE, Commander Benito Compito (at right) and Commander Ron Crockett (at left) continue to speak out about the needs and desires of the Skid Row Community. They are among the first to take to the streets and lead the charge. Both work with the children and families of Skid Row and speak about the future of the community and the positive movement that continues to grow. 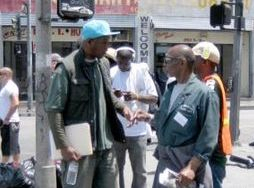 SKID ROW BRIGADE member, Mr. Edward Hannibal (pictured here at right side), networks with community members letting them know that we are at their service. Involving the local community residents is what makes the BRIGADE grass-roots and part of the neighborhood. Being part of the community is "empowering the community". Big Rob, also a community artist and poet, while "homeless", took care of the Northside of San Julian Street. He continues to represent THE SKID ROW BRIGADE as well as SKID ROW ARTIST COLLECTIVE (SRAC). You can find him strolling through "ART WALK" on the second Thursdays of some months. Here, Chairman, Commander OG Man presents Katherine McNenny her "greens" to recognize her rank as "Commander" in the SKID ROW BRIGADE, the Greatest Volunteer Unit in Downtown Los Angeles. BELOW IS A VIDEO CONDUCTED AT " THE INFAMOUS GLADYS PARK " , HOME OF THE AWARD WINNING SKID ROW 3ON3 STREETBALL LEAGUE. THIS TOO IS PART OF " OPERATION FACE-LIFT/ SKID ROW " POSITIVE MOVEMENT.